The Adams Cottage press was patented by Albert Adams in 1861 and manufactured by Joseph Watson (inventor of the Young America), operating as the Adams Press Company, in New York. 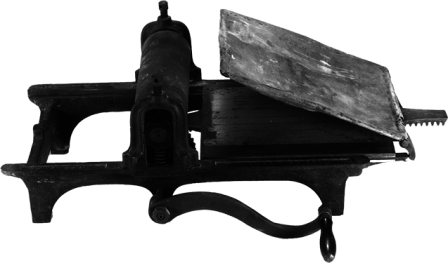 The press was advertised as a portable, do-it-yourself press for amateurs and businessmen. The Cottage Press prints from either end, and has a self-acting tympan (the frame that carried the paper to be printed) and an attached inking apparatus was also described in the patent. It was made in five sizes and printed an area from 3″x4″ to 13″x19″. Adams’ presses, like similar small cylinder presses made by Cooley and the Cincinnati Type Foundry, were known as Army presses from their use in the field during the Civil War.